ART - just do it! : First birthday card of the year!! First birthday card of the year!! It has been weeks since I was in my craft room being crafty!! I hope you all had a good Christmas season and are considering your creative goals for the season!! I am committed to making Christmas cards year round so will be working with my sister, Sylvia's challenge when I can. You can check out her Christmas Card Challenge here on her blog. I will also be working on home projects this year as I have been putting them off for 3-4 years and they need doing. 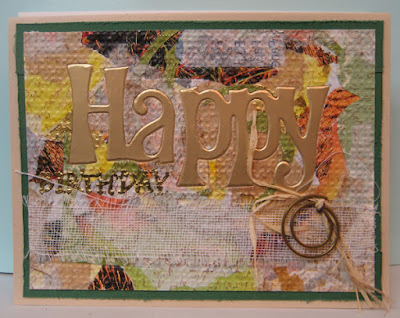 I am continuing my special occassion cards for family and friends and my bimonthly cardmaking classes as well. On that note, here it the card I made today for my brother who has an early January birthday!!! I used one of my serendipity backgrounds which was embossed with the Lattice Embossing folder (SU). I stacked a gold layer with it and then die cut the HAPPY (SX) word from both of them. I backed the holes with packing tape and inserted the gold letters and made sure to add back in the openings from the serendipity in the a and the p s. I used my homemade stamping jig to get my "birthday" stamped exactly where I wanted it and then embossed with gold embossing powder. I like the distressed look of it!! 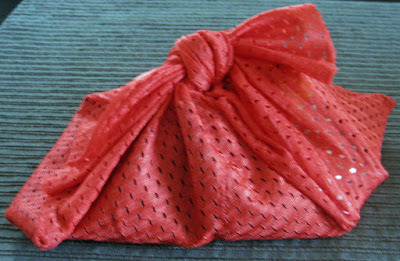 I layered on a gauzy fiber below it and added a gold round paper clip to which I had tied some raffia using a single stitch of crochet thread. I backed this layer with green cardstock strips and then distressed them before gluing this large element to a tan card front!! I have the gold layer with the serendipity letters still sitting on my desk and they will likely be my next card of the year!! I hope you will find a way to be creative this coming year and will take the time to share it with those around you! At every moment we have the opportunity to make a different choice and today is as good a time as any! !